If you’re going to treat yourself, you want it to really be worth it. This Veggie-Friendly Rocky Road Chocolate hits the spot in so many ways: creamy chocolate with a satisfying bite, crunchy biscuit, chewy cranberries and they’re a little lighter than full-on rocky road bars. The real star of the show, however, is the vegetarian marshmallows! If you’re anything like me then you might have resigned yourself to never eating them again, but fortunately there’s a great selection of gelatine-free marshmallows out there these days. I can’t think of a better use for them than this! The recipe would work with any kind of chocolate but I love a good quality dark chocolate that’s rich and creamy but not too sweet – perfect to combine with sweet marshmallows and tangy cranberries. 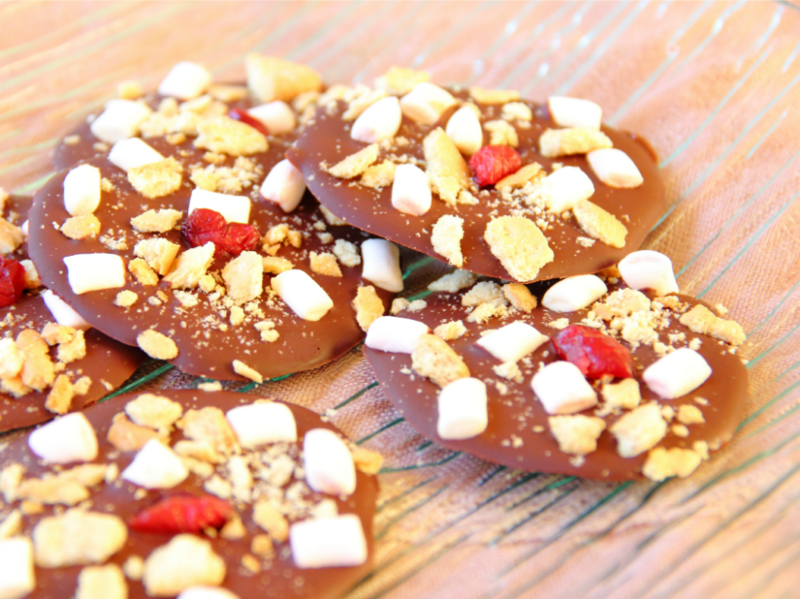 If you use a dairy-free dark chocolate then these Rocky Road Medallions are also suitable for vegans. Melt the chocolate in a bowl over a pan of hot water, stirring until it is smooth and silky. Spoon out onto a sheet of baking parchment into round disc-shaped portions. Leave to cool for a couple of minutes before sprinkling on the marshmallows, broken biscuits and cranberries. Pop in the fridge for ten minutes, carefully remove the backing paper and they’re ready to eat! Have you tried vegetarian marshmallows before? What would you make with them! ?